To do that, Sergey Brin rushed onstage at Google I/O wearing the glass units to give us a brief live action demo courtesy of a skydive over San Francisco. Video of the jump, performed by four divers in a blimp, was streamed live through Google Hangouts to attendees at the Moscone Center. In keeping with the extreme vibe of this demonstration, the showcase was handed off to bikers on the rooftop, also outfitted with the lenses, who jumped from building to building via ramp and then eventually cycled into the arena and right up to Sergey, himself. As a finishing touch, Brin also snapped a shot of the team using his own headset. All told, it's a pretty incredible way to once again officially tease this forward-looking tech. Google revealed that the Glass headset features most of the components you'd expect inside a smartphone, including a powerful processor, lots of RAM, an accelerometer, gyroscope, wireless radios, a microphone for voice commands, a speaker, a camera, and a touchpad on the side of the device. The Glass' transparent display is slightly above your line of vision so as not to interfere with your normal life, and according to Google the gadget is actually lighter than some pairs of sunglasses. Sergey Brin had three different prototypes on stage -- a light blue pair, a white pair and a black pair -- indicating that personalization and style were concerns. And that's a good thing since Glass is meant to be worn in public. Ultimately Google hopes that the project will be the next step in its quest to make information quickly and universally accessible. The ability to capture images from the first person perspective seems to be key to the device. In a new demo video, a new mother waxes about how hard it is to capture those perfect moments with her child. She "smiles at faces not devices" which makes sticking a D5 in the baby's face a bad idea. 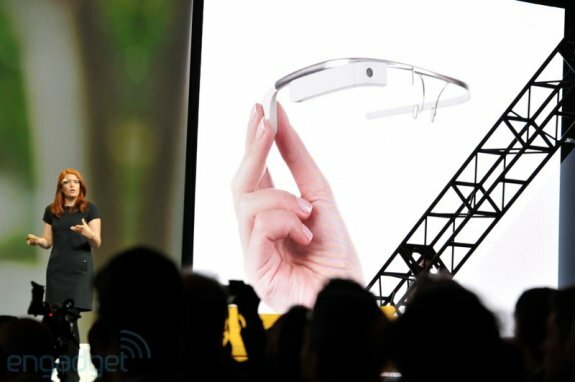 Details about a launch date or price target weren't revealed, but US-based I/O 2012 conference attendees had the oportunity to pre-order a Glass Explorer Edition for a whopping $1,500. These dev kit like devices will ship in early 2013.